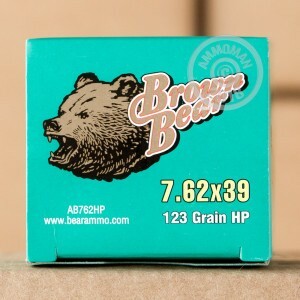 This 7.62x39 123 Grain Brown Bear ammunition is an economic and dependable solution for your self defense or range training needs. 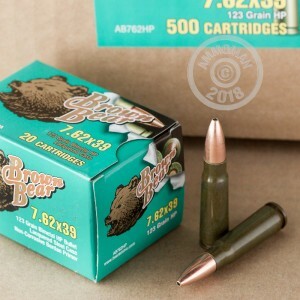 With this order, you get 500 Rounds of Brown Bear Hollow Point ammunition in new condition. The casing is made of laquered steel and is not reloadable. This ammunition is loaded with modern, non-corrosive Berdan-primers. Brown Bear uses Berdan priming to extend the shelf life of their products and guarantee fire ignition. 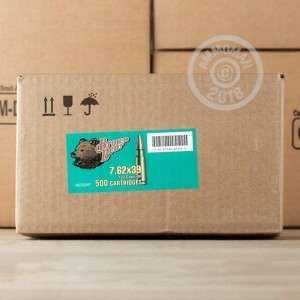 Brown Bear ammunition is loaded to exacting standards for military specification ammo. Brown Bear ammunition is manufactured at Barnaul Machine Plant in Russia. In 1869, Emperor Alexander I ordered the opening of the first Brown Bear cartridge plants in Russia. Those plants supplied cartridges to the Russian Army and Soviet Army in both World Wars. Although the Barnaul facility is one of the largest suppliers in Russia, they also regularly provide ammunition to America, Europe, and Asia. My MAADI just ate this stuff up. Great ammo! Would recommend to anyone. I noticed that for the same price you can get the Brown Bear FMJ for the same price and it is sealed with the poly coating which does not build up at the breech like the lacquer sealed ammo does. This is not a tremendous problem as it does take a lot of round for the lacquer to build up enough to be problematic and the stuff is removable with a chamber brush and some elbow grease but the poly coating is far superior. The hollowpoints on this ammo are too small to allow for expansion too so you might want to go with the somewhat cleaner polycoated FMJ Bear ammo as again, the HP rounds do NOT expand, the "opening" is simply too small to allow for expansion. Harvested a deer two seasons back with an HP bullet and recovered the round.....not a single sign of any expansion, just some deformation from hitting bone. Finally shot this in my ska. No complaints. Good ammo, good price. Buy it. Haven't had a chance to shoot in my sks yet, but gotta say awesome shipping and great price. Ordered on a Wednesday and received my shipment on Friday. Awesome job.